St. Andrew (Andrei) Rublev (pronounced roob-lyof) wrote and proclaimed the Gospel with paints rather than with words — he was an iconographer (a person who writes/paints icons). 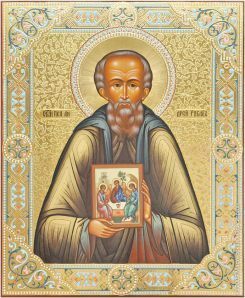 His icons have been regarded for almost 600 years as so perfectly shining forth the divine splendor and radiance, joy and love—witnesses to the truth of Orthodoxy—that other iconographers have been directed to use his icons as models. He worked with the best iconographers of his day, painting some of the most important churches in northern Russia. Through his most famous icon, the Holy Trinity (photo, right), he has eloquently preached a beautiful sermon about the nature of the Holy Trinity. St. Andrew is frequently depicted holding this Holy Trinity icon (as he is in both of the icons of him shown here). The Orthodox Church teaches that the divine Word and Light can be proclaimed just as powerfully in written-in-paint icons, as in written-in-ink words. "We proclaim our salvation in words and images [icons]," we sing in the Kontakion for Orthodoxy Sunday. How do iconographers fulfill such a high calling—to let God speak to people through their icons? It is by working together with divine grace, and by living a holy, pure and simple life. And how does one live a holy life? Most of the saints, including St. Andrew, lived to serve God above all else, and worked hard to overcome their self-centeredness (that gets in the way of God speaking through them) by strict fasting, abstinence, prayer, frequent reception of the Holy Mysteries, helping the needy, and by cultivating the spiritual attitudes of humility, patience, joy, peace and love. Sometimes, as with St. Andrew, the Holy Spirit leads persons to express great love for God and His creation by becoming monks. St. Andrew further expressed his love of Divine Beauty in his painting/writing of icons, through which God still speaks loudly and clearly to people today. 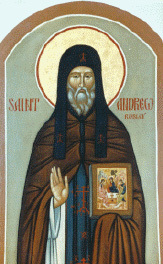 St. Andrew was born near Moscow, and as a youth, knew St. Sergius of Radonezh, who had founded the Monastery of the Holy Trinity about 45 miles from Moscow. It was at this monastery, now known as the Holy Trinity-St. Sergius Lavra, in the city of Sergiev Posad (see the Sacred Places article), where St. Andrew became a monk, and where he has long been venerated as a saint. 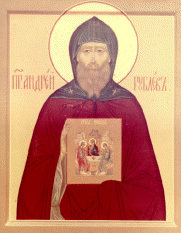 He painted his Holy Trinity icon for the Holy Trinity Church there, where St. Sergius’ tomb still is today. St. Andrew also lived, worked and is buried at the Savior-Andronikov Monastery in Moscow. Those who knew St. Andrew testify to his strict ascetic and holy life and his great love for all. God granted him to have visions and contemplate the immaterial Divine Light. After his repose, he appeared in a vision, clothed in radiant garments, to his friend and fellow monk-iconographer, Daniel Chornii. Although many have testified to his sanctity, the greatest testimonies are his icons themselves. None but a true saint could have produced such marvels of beauty and truth. St. Andrei's relics are probably buried beneath the floor of the Savior Cathedral (photo, left) of the Andronikov Monatery in Moscow, where the blessed one was living and working at the time of his repose, and have yet to be unearthed. Although he had painted the entire interior of the Savior Cathedral, nothing whatsoever remains of these fresco icons. Probably what saved the Andronikov Monastery from total destruction during the Soviet era was its establishment as the site of the Andrei Rublev Musem of icons. 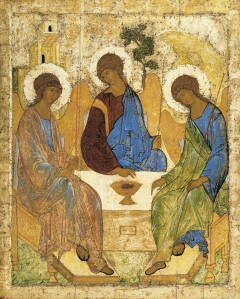 Although many of its icons have been moved to the Tretyakov Gallery, may beautiful icons still remain here. The Savior Cathedral was returned to the Church and reopened in May, 1991, and the monastery itself has finally been returned to the Church and re-opened as a monastery relatively recently. The icon at the top was painted/written by Fr. Theodore Jurewicz, of Erie, Pennsylvania, and is located in St. Innocent of Irkutsk Orthodox Church in Redford, Michigan.